Three Arch Bay gated community in Laguna Beach is located in the South Laguna Beach area with homes located on the east and ocean side of Pacific Coast Highway. There is a mixture of oceanfront, ocean view and coastline view homes in Three Arch Bay. Three Arch Bay is rich in history as one of the first communities in Laguna Beach dating back to the early 1920's. Even back then, residents hand picked the Three Arch Bay location for it's dramatic ocean and coastline views of the Laguna Beach coastline. The community features a secure guard gate at both communities with recreational tennis, park and kids play area. Home prices can range from $2 to $25 million depending on the location and view of the home. Rental home prices will also vary and will range from $5,000 to $25,000 a month. You may also want to view Upper Three Arch Bay homes as they offer a private secure gated entrance and stunning ocean view homes. Upper Three Arch Bay homes have the same association as Three Arch Bay but are located on the east side of Highway 1. The homes are lined up the hill for maximum views of the pacific ocean and coastline views. Three Arch Bay is a wide selection of homes for sale and are located on both the east (Upper Three Arch Bay) and west side (Lower Three Arch Bay) of Pacific Coast Highway. 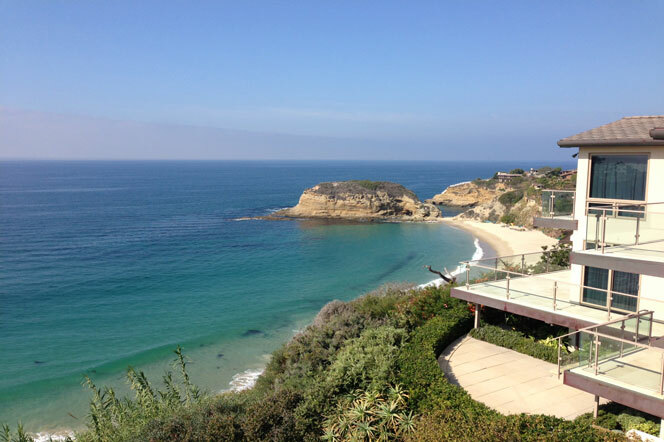 Lower Three Arch Bay is the best place to find oceanfront homes in South Laguna. This is a view of the beach access at the top of the hill. A lookout point overlooks the beautiful bay. The community has nice Tennis courts and children's play area. Below is a photo for the south side beach access in Three Arch Bay.